A study released yesterday shows that Vancouver’s affordability crisis is deepening. The study, released by BMO Capital Markets, shows that Vancouver’s unaffordability score (a ratio of median house price to median household income) has increased to 11.2. Affordability is defined as a ratio of 3, meaning that the median house in Vancouver is almost four times the affordable rate. In 2009, Vancouver scored 9.3 on Demographia’s annual affordability report, making it the most unaffordable city in the world out of 272 studied. In 2010, Demographia showed that Vancouver’s unaffordability score increased to 9.5, with only Hong Kong and Sydney competing for most unaffordable spot out of 325 global cities studied. BMO’s report suggests that Vancouver housing prices have spiraled further out of control. The report suggests that “land-use restrictions” and “high quality-of-life rankings” attribute partly to high housing costs, but that these factors are not enough to explain the “unsustainable” high prices. The report suggests that foreign investment, particularly from China, is driving the speculative housing bubble. How do we interpret the BMO report? That said, it is important to refrain from scapegoating “China” as the cause of the problem. Much of the capital sunk into Vancouver’s real estate market is generated by domestic networks, and by no means is China the only source of foreign surplus capital. Surplus from the Canadian resource extraction sector, for example, is a large source of housing speculation and investment. Given Vancouver’s long tradition of anti-Asian racism, we must be especially vigilant that old racists not use “foreign investment” as a new excuse for old racism. The NPA is attempting to make electoral gains by transmuting the affordability crisis into an ethnic one. Such attempts must be resisted forcefully, and progressive voices should focus on concrete measures that empower low- and middle-income residents of all backgrounds against developers and speculators. The best way to address the affordability crisis is to take measures that limit speculation regardless of the source of the capital – domestic or foreign. As Martin Luther King Jr. never tired of saying, we should “unite under the slogan of resistance to injustice.” Vancouver’s affordability crisis hurts low- and middle-income people and people of colour especially hard. Further, recall that surplus capital extracted from China is made possible by the conditions of oppressed labour sustained by Canadian-based capital networks. All oppressed groups are natural allies, and the networks between us are potential lines of solidarity and strength. Posted in Analysis, Gentrification, Homelessness, Housing, News. Bookmark the permalink. That’s a horrible chart! Un-labeled axes aside, the scale changes in an irregular way in the most relevant part! 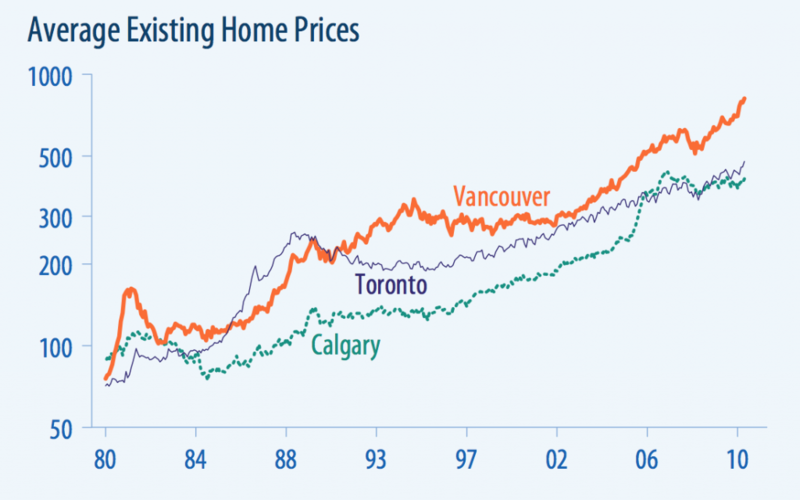 It’s neither linear nor logarithmic, and disguises the actual value of a Vancouver home, as well as the relative difference between the three lines. I think that a bit more discussion about the sources of and solutions to the speculation problem. The reality is that a large portion of the property is being bought as investments by Chinese people, but I agree that that ought not inspire racism. For example, the house I rent in was recently bought by Chinese owners who don’t intend to live in it, but one of the three suites was unoccupied, and they’re keeping us on as tenants, under the same conditions, and are working to make the other suites inhabited! Haha – yes, that BMO graph is atrocious…something about its quirky absurdity compelled me to use it. Most of the empty condos downtown are not affordable with respect to Vancouver income levels. You might even argue that they are empty partly because people cannot afford them! So increasing the supply of luxury-finish condos for singles is not going to solve the generalized affordability problem. Profit-oriented developers are not building units for low- and middle-income people. While agreeing with most of your suggestions for dealing with this problem, I’ve got to ask a question about the NPA creating an ethnic ‘crisis’. If you make such a serious accusation you should at least be willing to provide a quote or an example, and preferably something a bit more than a statement of fact that massive capital inflows from China are occurring. I’d better add I have never even voted NPA. To graphically see how many properties are empty in this city take a walk on Granville Island at night and look at the towers on North False Creek. Notice how dark they are. Very perceptive article and I really appreciate your insight! I want to add that now the Canadian immigration policy favors rich immigrants. The housing crisis is one of the consequences of immigration policy as well as many local planning policies. I am concerned if anything can be done when the city, province and Stephen Harper don’t collaborate for the interests of local residents. I always find it problematic when the councilors claim they need to build to accommodate population growth in ** years. With changes in China, I doubt the country would provide “sustainable” supply of newcomers for Vancouver.It is quite a pity when politicians talk, they don’t seem to have a clue about China and changes there. This is not entirely related, but I feel moved to add it anyway. Over any given month there are literally thousands of affordable market rentals in both the City of Vancouver itself, and throughout Metro Vancouver. Most of these are in the form of two, three and even four-bedroom basement and ground floor suites in single family houses. Some of them are no doubt a bit grim, but many are not – see pics on Craigslist listings. A small adjustment in the “shelter” allocation given to Income Assistance recipients in BC, for singles especially, from the current $375 monthly, to say $425, makes many units available to welfarers, but really only if they double or triple up with others. A check of Craigs at any time shows 2-br units at $750, two times the current allocation of $375, are very limited, but for $850 – two times $425, there are many. The same applies to 3-br units: few for $1125 and far more for $1275. This prov government is in no mood to increase welfare, but allowing welfarers to get a monthly transit pass for $30, the same as college students, and not the current $81 they must now pay, for a one-zone pass, could let that $50 go toward housing. If a few hundred SRO tenants opted for basements, especially if they could get around on those $30 monthly passes, that frees up SRO space for people now in shelters, and in turn shelter space is opened up for street homeless. A campaign to get $30 monthly transit passes for welfarers is now underway. Dubbed “Fares Fair,” we are calling for support and participation. Cool, bye for now.